Norson Design’s development of several customizable 7m–12m (23‘–39.4‘) LOA RIBs for Ophardt Maritim, intended for professional users, required a three-way balance between high speed, good seakeeping, and comfortable running. At the same time, the firm was also keen to design for Ophardt’s automated production systems that employ high-precision robotic welding. For an in-depth look, see Robotopia: Aluminum Boatbuilding With Welding Robots. The collaborators’ aim was an aluminum hull with tolerances similar or even superior to those of a glass-reinforced plastic (GRP) hull. Design Challenges: Concept meetings made it apparent that certain aspects of high-speed-hull design taken for granted on GRP builds are harder to achieve in automated aluminum-hull production. Devising solutions to work for that process without limiting the boats’ performance and seakeeping abilities required innovative thinking. Designers had to modify high-speed hull features—such as steps, running flats, and spray rails—to complement the vessel’s strength and stiffness, and to fit the highly precise, yet very specific construction method. Using multiple-deadrise geometry with longitudinal steps and spray rails was unique for Norson, but it was pleased with the results, which combined high-speed running and stability with enhanced cornering and good overall seakeeping. The intense R&D included parallel computational fluid dynamics (CFD) analysis and sea trial runs to ensure that the geometry of these bespoke features worked equally well at all speeds. While laborious, that approach produced better-than-expected results. Ophardt’s first variable-deadrise hull proved that Norson’s design and Ophardt’s production technology can produce fast, stable boats that are easily scaled up or down to different sizes. Sea trials of the 9m (29.5‘) model revealed the boat’s dual-hull performance. Norson uses that term to describe two distinctly different yet stable “personalities,” depending on trim and speed. This variable deadrise concept is also found in Ophardt’s latest model, the 70-knot 12m stepped hull with triple outboards. The challenge was combining variable deadrises and longitudinal steps while maintaining good ventilation and pressure balance across their lengths, Norson explained. During the tests it became clear that proper integration of these custom hull steps is key to the vessel’s positive handling qualities. Construction: The hulls were built with Ophardt’s pre-stiffened system, which requires the panels to be CNC-cut and formed to their designed shapes before they are positioned on a base jig to tolerances of ±0.5mm (0.02“). The panels’ seams are then robotically welded, fast and in perfect symmetry. Fast welding means lower temperatures and less, or no, warping. The final product is a smooth-looking hull with perfect geometry, which is vital for high-speed applications to ensure precise handling and high performance. This approach also yields useful collateral benefits, including significant weight savings from internal structural elements and integration of secondary structures with primary ones—a crucial consideration for any small craft designed to operate at high speed—and increased plate thicknesses, which prevents hull plate deformation, i.e., by hard landings in rough seas. Since the entire production system is computerized, all hull structures are created parametrically (Ophardt calls this a “virtual mold”), so their base dimensions can be altered depending on the client’s needs. The changes are automatically distributed throughout the structure for accurate scaling without compromising scantling strength requirements. 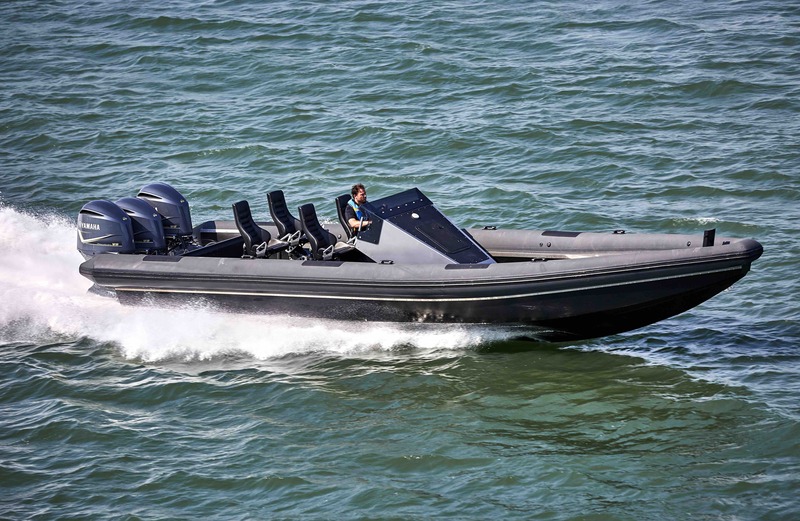 Ophardt currently produces the OPH/707/R, a 7m (23‘) boat where R denotes RIB, for a European marine police force. The 9m (29.5′) version—the OPH/969/D (D denotes D-ring fendering)—was tested and displayed at the High Speed Boat Operators (HSBO) Forum in Gothenburg, Sweden, and, along with the new 12m model, at SeaWork in the U.K. and at several high-profile military shows. Unlike the smaller boats, Ophardt’s 10m (32.8‘) and 12m models are offered with in- or outboard propulsion for speeds of 70 knots and faster. All boats can be customized to suit specific user requirements for the missions they perform, from special operations to general patrol duties. Attention to Detail: The hulls’ generous beam permits higher occupancy and more payload while also offering a decent amount of walk-around space. Ophardt pays close attention to ergonomics and comfort in the RIBs’ layouts; i.e., a unique console has an adjustable steering wheel to help drivers find the best seating position for operating safely at high speeds in a seaway. These boats are designed to reach their destinations as fast as possible and without beating up the occupants. Ergonomic seats allow passengers to find safe handholds for the best riding position, which depends on their height and stature. Looking back on the first year of cooperation, both parties are satisfied with their progress and future prospects. Ophardt Maritim’s innovative production system and Norson Design’s focus on efficient hullforms and the integration of different propulsion systems seem to complement each other rather well.